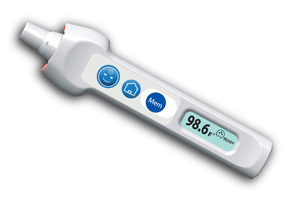 The first non-contact clinical thermometer, the Thermofocus uses harmless and safe infrared technology to measure patient temperature instantaneously and accurately. LED display offers readings in Fahrenheit or Celsius. FDA approved. Provides over 10,000 readings using 4 AAA batteries (not included). Takes forehead, navel or armpit readings. There is no direct contact with patient during readings, so probe covers are not needed.